If Doc Brown was a touch more suave he would have certainly dumped the DeLorean for a Ducati. Marty wouldn’t have cruised into the past to meet his parents at 88, he would have screamed into the past at 188 with nothing but the numbers “1199” between his legs. And you know what he would have been wearing? 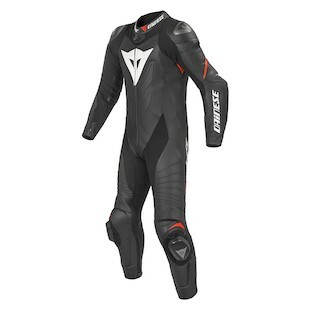 Dainese. Blending the past with the future, old shenanigans with new, Dainese makes a ripple in the space-time continuum with their new for 2013 Laguna Seca EVO Race Suit. It comes in perforated. It comes in non-perforated. It has tall sizes. It has short sizes. It will make people named Biff jealous. And if you’re lucky, it won’t make your own mother fall in love with you. We’ll start off with the bad news - traveling into the past can’t always be as much fun as playing "Johnny B. Goode" at a 1955 high school dance. You see, it turns out Dainese made the decision to use their regular cowhide in the new Laguna rather than D-Skin, which they used in the Laguna Seca Pro. In the grand scheme of things this isn't a big deal, as Dainese’s cowhide is damn good in its own right. The trouble is that the new suit has the same MSRP as the old one, but without the premium leather. The good news is that while you lose the abrasion resistance and supple touch of the D-Skin, you gain a whole mess of new features. There are new stretch panels, and more of them - both in elasticated and microelasticated forms. It sounds like it’s from the future, but we promise it’s not. While the venting scheme remains largely the same, the Dainese Laguna Seca EVO now comes in a non-perf and perforated version - a welcomed addition. Just as well, the perforated version comes in short and tall sizes (but only 50-56) - an industry first. Maybe you’re not ready for it, but your lanky kids will love it. Beyond the loss of the D-Skin, the Laguna Seca EVO Race Suit sacrifices nothing. It still has a wealth of S1 stretch panels for fit and comfort, as well as Dainese’s suit-to-boot connection system so you can look like the Doctor himself (Rossi, not Brown). It uses the same ventilated speed hump, but now features mesh panels behind the neck and behind the knees. The entire suit is certified to the CE Category 2 standard, which in practical terms means covered zippers and increased protection overall. If you don’t plan on needing roads where you’re going, Pro Shape soft protectors, composite armor, and co-injected shoulders with aluminum inserts will keep you in one piece throughout your time travels. And for those out there who want to look good for their teenaged parents, you will be happy to find both a garment bag and a Protection & Cleaning Kit with your new race suit. Alternatively, Dainese also makes the Dainese Laguna Evo Perforated Jacket. This is the closest assimilation of the full race suit, both in fit and features, but in jacket form. I once read on the internet that an optimist is someone who figures that taking a step backward after taking a step forward is not a disaster, it's more like a cha-cha. I think Dainese would agree with that statement. In fact, they I think they liked it so much they made a race suit that embodied it. The Laguna Seca EVO breaks some new ground on most fronts, but retreats on one. In the end, the flag is moved forward and Dainese yet again churns out a quality product that will be worth all the hype..